There's a stark difference between those who can simply cook, and those who possess skills in culinary arts. This is the like the difference between a painter and an artist: while one certainly possesses some degree of competency in the field, the other demonstrates the ability to create, inspire, and transcend, providing deep and rich experiences for those who are fortunate enough to interact with the artist. Food is not merely an essential part of our survival, but it represents an area that is deep and rich for artistic expression. Many meals we eat merely serve the former purpose, but each of us has enjoyed those unforgettable meals that have provided us with the latter experience. When you obtain you Associate's Degree in culinary arts, you are working towards mastering the way food is prepared and enjoyed. This makes our experience of food not merely a necessity, but a truly enriching pleasure. And it makes you more than just a cook it makes you an artist. Learn the secrets behind the craft and begin inspiring our palates and our spirits with your masterpieces. A degree in culinary arts provides would-be chefs with an array of skills and knowledge to make them worthy of the title "chef." Although this coursework does include some instruction inside of a classroom, much of the education is received through hands-on training in a kitchen. There, your mind will learn about food while your body practices actually preparing it. You'll work directly with the ingredients, techniques, tools, and appliances that help you craft your masterpieces. Courses generally focus on food and kitchen safety, nutrition, culinary-specific mathematics, gastronomy, product knowledge, and management training. These are all in addition to learning about classic and contemporary methods for preparing delicious recipes. Many of those enrolled in culinary arts aspire to do more with the cooking skills than merely preparing better food at home. Common areas of employment include cooking at a restaurant or bakery, owning a restaurant, or running a catering business. But there are many levels of employment inside each of these career avenues. Working as a baker or pastry chef is a common entry-level position at restaurants or bakeries. The food service industry is involved in many areas that don't necessarily specialize in food: for example, schools, college dorms, hotels, resorts, hospitals, and corporations all have need talented chefs in their kitchens. We just don't ordinarily think about chefs in these locations. The word "chef" actually means "head cook" in French, and refers to the authority in the kitchen. Earning a position as a chef inside of a restaurant is one many culinary students imagine themselves in, potentially aspiring to the head chef position. Many chefs, however, are talented enough with food preparation, menu development, and business administration that they promote themselves by opening up their own restaurant that features their own specialty menu. Others who prefer to bring their cooking to customers might work in or own a catering company that supplies food services to whoever hires them. There's much more to making food than simply mixing ingredients together and letting the oven do the work. With an Associate's Degree in culinary arts, you will master the instruments and techniques necessary to produce wonderful, memorable meals for customers in bakeries, food service areas, restaurants, and catering. Whether you work for others or are committed to running your own business, you will find happiness and success producing savory meals that others doubtless enjoy. So it's time to step into the kitchen, grab your hat and apron, pick up your kitchen utensils, and embark on the journey that will give you the knowledge and experience needed to work in an exciting culinary career. Baking Associate’s Degree Program – If you have a passion for baking then join the 1000’s of new chefs each year that start their new cooking degree. Catering Associates Degree – Learn what it takes not only to run a restaurant but a successful catering business. Learn from the best in any of the Associate degree programs listed from schools nationwide. Cooking Associate’s Degree – Want to learn to cook or perhaps one day become a chef? 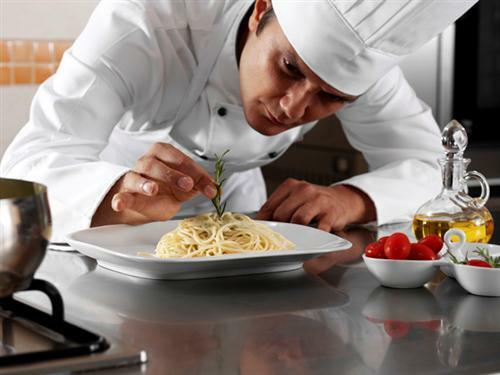 Get started with your AA degree in cooking from any of the accredited schools listed. Associate’s Degree in Culinary Arts – Start by researching the top culinary arts programs in the country and earn your degree in less than 2 years for more programs. When looking into which school to attend for your Associate’s degree in culinary arts you’ll want to pay special attention to the below areas. It is always recommended that you take your time and research the schools you are considering enrolling in. Curriculum – Sounds obvious but you’ll want to make sure that what you taking will get you the experienced needed for the type of job you want after you graduate. When you talk to your admissions representative be sure to tell them your career goals to verify what you are enrolling in is the right fit. Connections – Is the culinary school you want to attend have good connections within the industry? Will they help you find a job after you graduate? Be sure to have them verify not only their placement rate but also give you actual places their graduates are currently working at. Tuition Cost – The average tuition cost for an Associate’s degree in culinary arts will run $22,000 however we have seen school that charge over $50,000 and even have waiting lists to enroll. It isn’t the cost of the program that determines which ones are the best. Externships – Make sure to find out where your externship will be located. Is it located in another city that will be difficult to drive to each day? Is the place you’ll be working a respectable establishment? Your school should be able to tell you this information before enrolling. Accreditation – The ACF is the top chef accreditation schools can receive but this can take years. If the school you are interested in doesn’t have this accreditation it doesn’t mean they aren’t an accredited school. The key is to find a culinary arts school that is accredited and recognized by the Department of Education. Facilities – Are the student to instructor ratios small at the school you wish to attend? Do they have a modern kitchen that is open for you to train in? You’ll want a good class size to get more personalized time with the instructors.